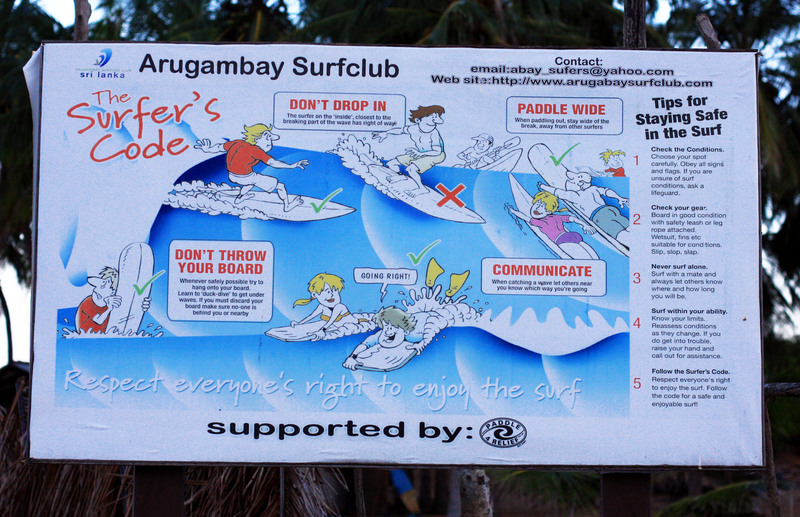 Arugam Bay has been known as a top surfing area for many years now. During the season, from about May to November, it is easily the most popular destination for foreign visitors to the east coast. It’s a working fishing beach and there is quite a lot of rubbish on the sands, compared with the southern beaches, and is perhaps not the best place to come just for a beach holiday: most foreigners I met were there for the surfing. Many locals want to clean up the beach, however – see below – so this may change. For now it’s still very pretty, and quiet, if you want a place to gather your thoughts, and you can visit nearby mangroves on Pottuvil lagoon, or go to Kudimbigala Forest Hermitage to see Buddhist shrines. The Lahugala-Kitulana National Park is 16km inland from Pottuvil and large herds of elephants move there during the dry season (July and August). The road from Arugam Bay is now completely open so you can travel south to Okanda and visit Yala East National Park. This park was closed from 1985 to 2002 because of the Civil War and during that time there was a lot of poaching (which, sadly, still goes on) so there is not as much fauna as in the more famous Yala National Park to the west. Nevertheless, the Kumana Bird Sanctuary is heaven for twitchers and since the park does not receive so many visitors, it’s a less frantic experience than in Yala West, with many fewer jeeps racing around full of noisy people carrying cameras with enormous lenses! There are not many buses going here from Monaragala so make sure you turn up early as they get very hot and crowded, and you don’t want to stand all the way. When I did it the 44 mile journey took over three hours! The bus seemed to stop about every 100m and at one checkpoint everyone was ordered off the bus and searched by the military. 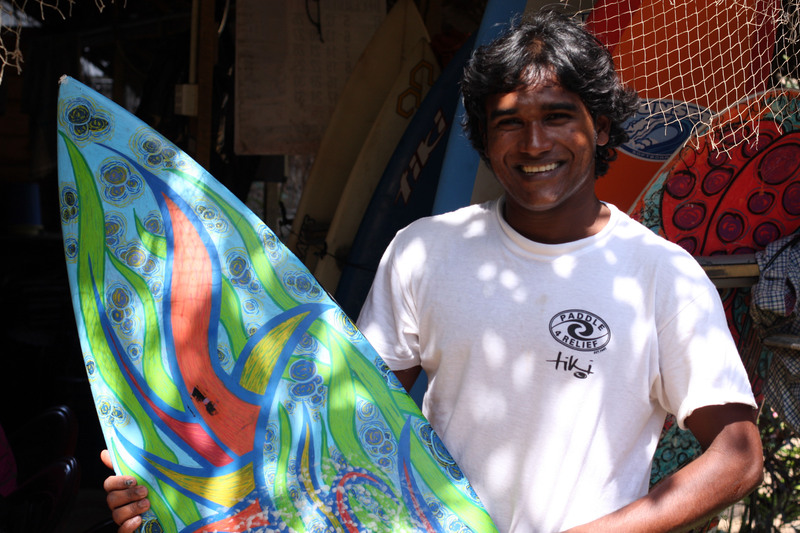 I walked along the beach to the main surf point one afternoon and was lucky enough to meet Krishantha Ariyasena, who is 23 years old and is one of the founders of the Arugam Bay Surf Club. He invited me to visit him next morning at his family’s guest-house, the Freedom Beach Cabana, to tell me more about it. 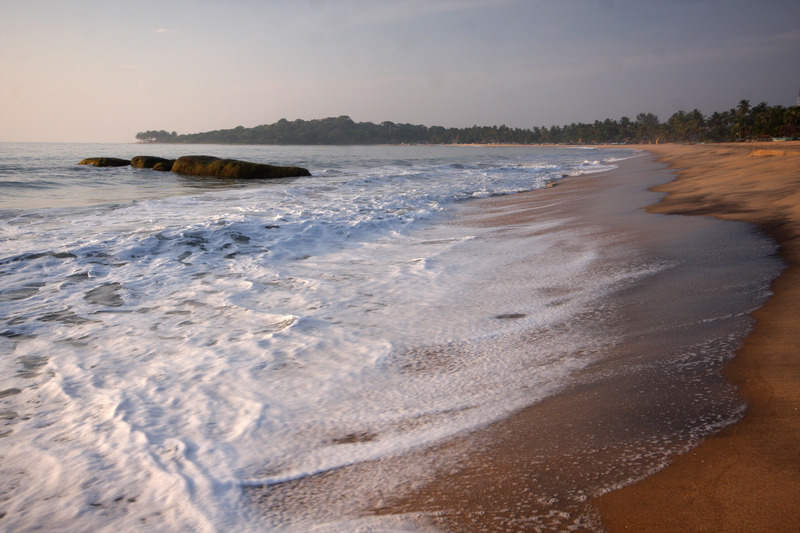 The guest-house is a laid back, surfy place at the southern end of Arugam Bay, popular with long-stayers and return visitors. An Australian was eating a breakfast of rotti and dahl when I arrived, and loyally claimed it was the best food on the beach. The food is cooked by Krishantha’s sister, and did look tasty. 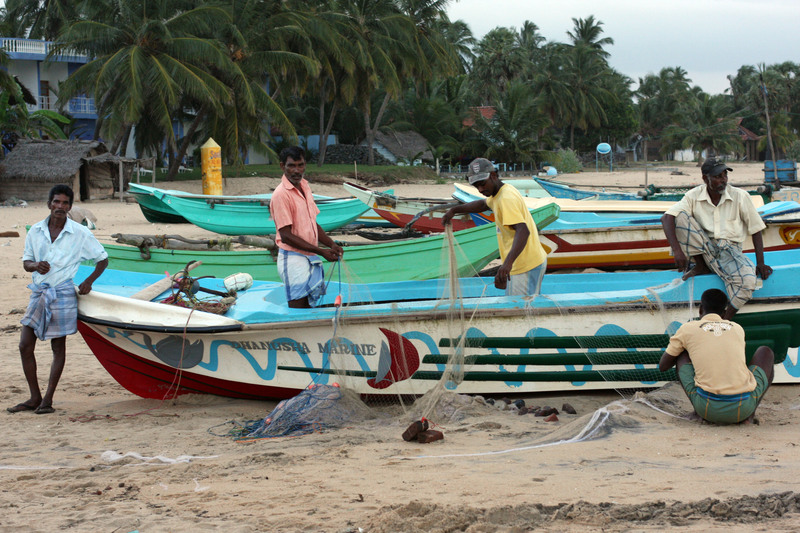 Krishantha was born in Arugam bay and has lived here all is life. He apologised for the quality of his English but I found him easy to understand, and apologised in turn for my lack of Sinhala. He has been surfing since he was a child and is passionate about the surf club. Arugam Bay was badly hit by the Boxing Day 2004 tsunami, as was the entire east coast, and although most of the properties here have been rebuilt, the trauma people went through will clearly take much longer to recover from. The WQS was staged in Sri Lanka for the first time in June 2010, with trial events for the local surfers sponsored by Indola sports. The International Surfing Association has previously held competitions here but the WQS was a much bigger affair and attracted a lot of media attention. This year, in July 2011, the British Pro Surf Association (BPSA) are holding the Champion of Champions Surf Contest. I asked Krishantha if he would be competing in it and he laughed. With this level of dedication and commitment the future of Arugam Bay looks promising, but local businesses really need to think as much about the community as about making money for themselves, and everyone need the tourists to keep coming. Then again, there is such a friendly atmosphere here that for many visitors to Arugam Bay the problem is making up their mind to leave. I shook hands with Krisantha and wished them all luck, sincerely hoping I could return one day. The Australian had finished his breakfast and he picked up his board, saying all this talk was very interesting but it was about time to go surfing. Hi, my name is Wendell, I love what you have written here and was wondering if you had contact details for Krishantha? I would like to meet him when I am next in Arugum Bay and hopefully surf with him..
Hi! Just call in at the Freedom Beach Cabana, his family’s guesthouse, at the southern end of Arugam Bay. 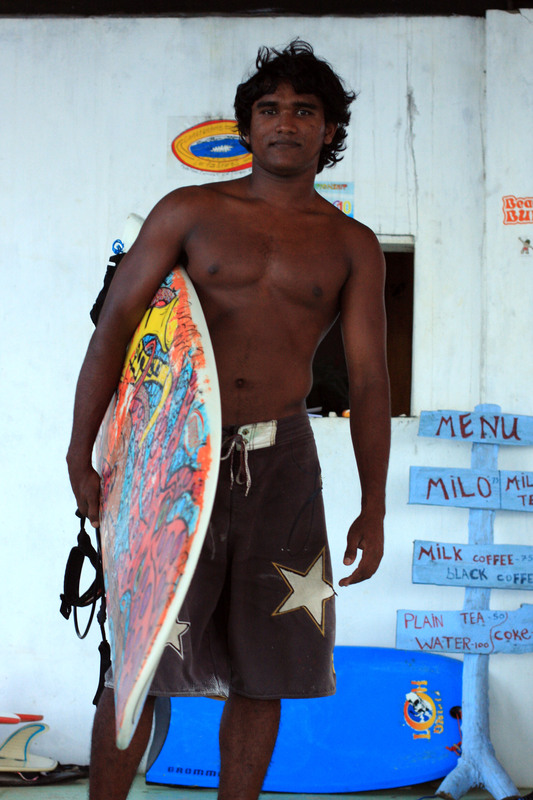 Or ask any of the Sri Lankan locals at the surf point. He is well known. I have heard they are now fighting to protect the surf point from developers: developing it, ironically, for the WQS surf event. My name is Tim Pearson and I am s member of a suf club in England. I am trying to organise a little fun surf competition with some like amateur minded surfers in Sri Lanka. We are not very good surfers but we go away as a group each year to a new and interesting surf destination. Do you think that we could come and have some fun with the local surfers in Sri Lanka? If so, do you have any suggestions as to who I should contact please? My email address is the best way to contact me.